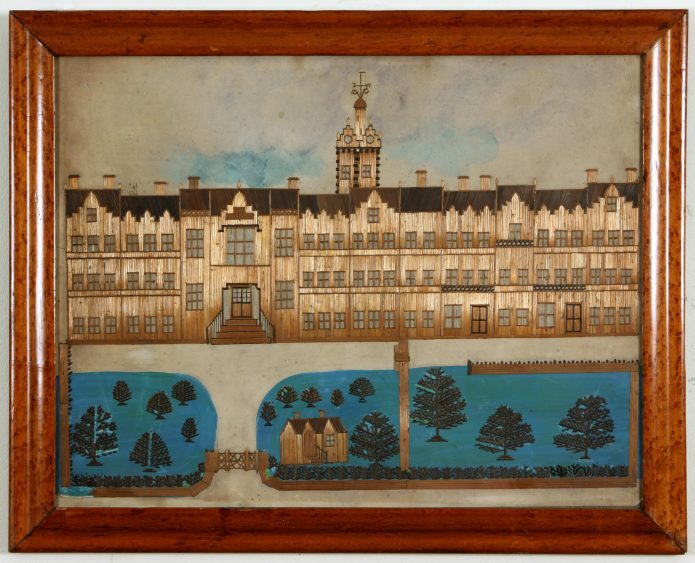 A rare folk-art straw work and water colour picture depictingThe NorthWales Hospital which is also known as the Denbigh Asylum. Similar straw work pictures are known, and often depict the Menai Straits and Conwy Castle. It has been thought that they may have been made by patients at the Glan-y-don hospital in Colwyn Bay, as a form of occupational therapy, but they might also have been made at the North Wales hospital. See similar picture illustrated in The Visual Culture of Wales: Industrial Society by Peter Lord, University of Wales Press 1998 and in English Naive Painting 1750-1900, by James Ayres,Thames and Hudson, London and N.Y. 1981. Also similar examples are held in the collection of the Welsh National Histor y Museum, St Fagans, Cardiff.